Vegas Magic slot is quite simple and is really nothing we haven't seen before from games such as Gonzo's Quest and the Microgaming series which includes Rugby Star and Basketball Star. Naturally a modern magician is the theme here with the velvet curtain forming the reel strips and a brightly-lit stage as our background with some magical classical music tinkling away as we play although it sounds like it was taken from murder mystery show to me! I like the magic theme when done well as with WMS' Magic Wand and Microgaming's Magic Boxes, so as long as this magician doesn't 'disappear' our bankroll too easily I can't wait to get started! We get 20 pay lines here over a standard 5x3 reels set-up. Now it appears the card suits which form the lowest 5-of-a-kind pays are stacked and for your 20-coin stake you'll get either 75 or 50coins for them. The real pays however are reserved for the single picture icons with the Lady Magician paying a huge 150x, Tiger or Dove 12.5x and finally the Top Hat or Magic Hoops offering 7.5x for a full line. The Magician himself forms an expanding Wild on the centre 3 reels with $ scatters doing nothing but acting as pays but for all 5 you would get 500x with 50x for 4 and 5x for 3. That's all there is to this game - any winning symbols which spin in are vanished away with a wave of the wand to be replaced by new ones cascading from above as in slots such as Da Vinci Diamonds. 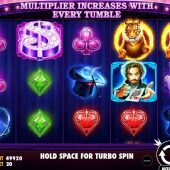 You get a multiplier increasing by one for each winning action with no limit. 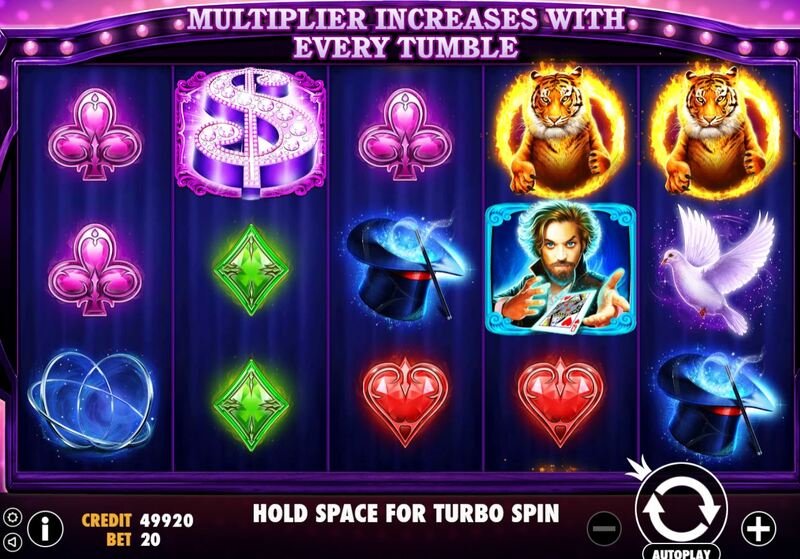 Think the Bonanza free games and you'll get the idea, but the multiplier resets each new spin unlike that slot. Pragmatic Play tell us we can win up to 3500x bet on any spin but after playing this for a reasonable period you'll be lucky to see a twentieth of that amount.